Here are our 60cm Modelling Balloons, the perfect balloon for the creative twisters. 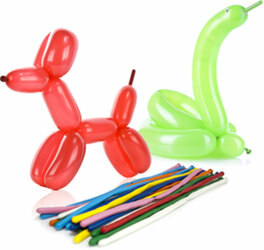 You can make your own animal shapes - let your creative side run wild here with these latex modelling balloons. Come with 250 units in one pack, available in assorted balloon colours. All our balloons are *100% biodegradable latex balloons.